From the train car, the snow looked like it was pelting the ground in a furious rage. Winston shivered, holding his bulky coat around his shoulders tightly. He always felt strangely protected watching it rain or snow from behind a clean glass window. There was something paradoxical about it—that clean feeling of knowing you’re protected from harsh precipitation, but only by a thin pane of glass. In reality, the snow wasn’t assaulting the earth in a furious rage. It wasn’t even angry. 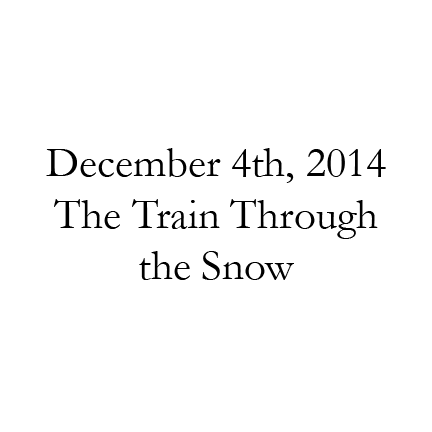 The train slowed, coming into another station, and the snow grew calm. Winston watched bundled passengers waddle off of the train, carrying their luggage on their shoulders or dragging it through the snow. Passengers boarded, the train departed, and the snow grew violent, once more. It’d been a long time since he’d felt like he was home. Anytime he heard a sentimental platitude like “home is where the heart is,” he grew a little more detached, a little more like that snow outside the window. Except that when his train slowed down, his pace never did. His life only felt like it tore past him, faster and faster, until instead of seeing individual flakes, the windows of his eyes only projected a blur into his mind. He tried to slow down, too many times, only to find that his thoughts came to a halt far from any city or town or train station, and so he kept on going. He scraped his mind to recall how long it’d been since he’d seen his parents, or his brothers, or his younger sister. A year, at least, he thought. Last Christmas, the weather might have only been as bad as it was now, but he used it as an excuse, nonetheless. They weren’t how he’d remember them—his mother and his father. His siblings, too, had changed and adapted. Or at least, that’s what he told himself. He tried, unforgivingly, to quench the small suspicion that festered in his train of thoughts: that maybe he was the one who had changed. The train slowed as it arrived at his station, but the snow didn’t. This moment held him with a repetitive stain. Every image flashed in his mind from every time he’d returned home for Christmas, or Thanksgiving, or Easter Sunday. Each image just like the last, only a little bit faded, like an old photograph. He stepped off the train, and the snow cascaded harder. The sky filled, almost mercilessly, with no regard for the ground. Winston carried his small pack over his shoulder, teeth chattering in the rush of cold air. He walked from the station to his parents’ house. The path knew him well, and he felt that he was walking in the footprints that he’d left in the snow the last time he visited. He lifted his eyes as he approached the house. A thick layer of snow disguised the roof and blended the brick with all of the others, but he’d know it anywhere. With his eyes closed, even. He had a feeling that even if he went blind, sixty years from now, in his old age, he’d still know when he was home. He walked down the last bit of cobblestone street, and up the weathered stone steps. The snow ceased, suddenly, but not with harsh intention. It’d been a long time.